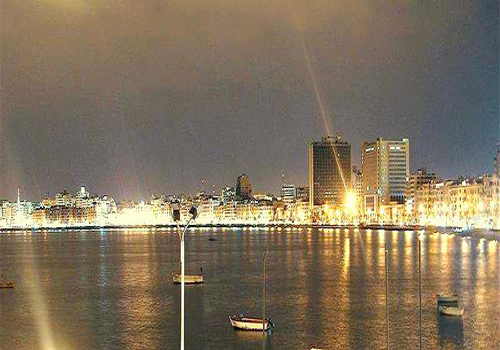 Alexandria has a huge European influence and it is one of the most beautiful cities of Egypt. 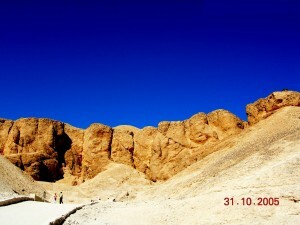 It is an year round destination and is located st a distance of 225 kilometres from Cairo. Alexandria enjoys a very pleasant climate all year round and during summers, the Egyptians too love to come and spend some time in Alexandria. Our first impression of this 2300 year old city was simply spectacular! I would recommend at least two nights in Alexandria as it has lots to offer as a city. The city itself is much older than Cairo and has been in existence since 332 BC. 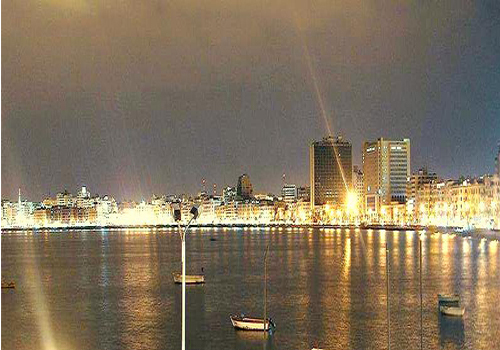 Alexandria is extremely rich in history and has a Mediterranean ambience. Built on a small village called Rhakotis, it was once the capital of Greco Roman Egypt and today it is the second capital of Egypt after Cairo. It has a multitude of sandy beaches and once was known for its legendary light house which was one of the seven wonders of the ancient world. 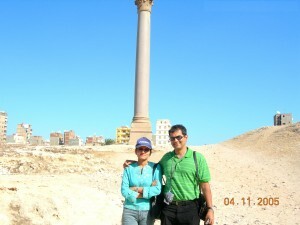 The lighthouse was located on the small Island of Pharos which was off the city of Alexandria. This lighthouse was the only wonder of the ancient world which had practical utility besides being an architectural wonder. It was also the tallest building on Earth at that time. The Light House was used for 1500 years and was 150 metres high and had 3 floors. Around the beginning of the 13th Century, there was a huge tidal wave which destroyed the first two levels of the lighthouse. Later when there was a big earthquake, a large crack occurred in the centre of the lighthouse which eventually collapsed. However, it did leave its impact from the linguistic angle as the word Pharos – which is where this lighthouse was built – finds a mention in the dictionary of French, Italian and Spanish languages. ‘Pharos’ stands for ‘lighthouse’. 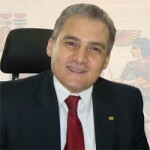 It is said that Alexander the Great came to Egypt’s north coast for a vacation when he discovered a tiny fishing village. He decided to transform this place into a city which would become a source of knowledge and light for the whole world and a city that would carry his name forever. Although Alexander never returned here, his passion for knowledge inspired Ptolemy I (who first governed Alexandria) to build a monumental library dedicated to intellectual and scientific pursuits. 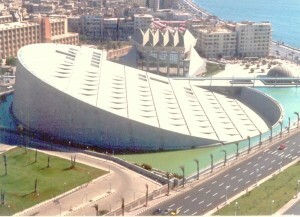 It took almost 10 years to finish the construction of the ancient library known as the Bibliotheca Alexandrina. – a complex comprising of 3 buildings and over 900000 manuscripts! The original library was later destroyed by fire and there are stories that the library was burned during the war with Julius Caesar in 48 BC. Some argue that it was destroyed or even burnt down when the Arabs conquered Egypt in 642 AD. The only remains from the original collection are a few manuscripts which are on display at the Vienna Museum. 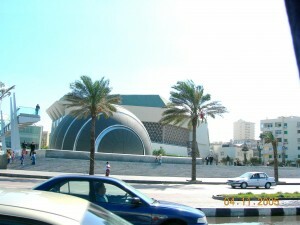 Later, an initiative to rebuilt the library was taken and in 2002, the library opened on the city’s Corniche, around 200 metres away from the location of the ancient library. The total cost incurred to build the library was 179 billion dollars. 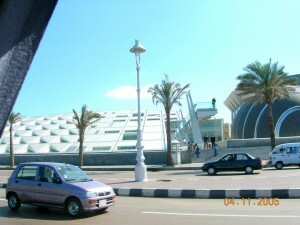 The Bibliotheca’s slanted round design stands out amongst the buildings in that region with the main building in the shape of a half sun rising from the sea. This shape implies that the library is providing the light of knowledge to the world. The main library has 11 floors, seven of them above the ground and four under the ground. The library houses 35000 books. We were unlucky to not see the Bibliotheca from the inside as it was Ramadan and the library was closed for public viewing on the day we visited the city. Our next halt was at the Montazah Palace and Gardens, the summer residence of the former royal family. Located on a high hill, his complex overlooks the most beautiful beach of Alexandria. 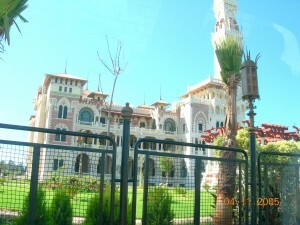 In the area, there are two prominent buildings, Al-Haramlek and Al-Salamlek. Al-Salamlek is now a luxurious hotel where as Al-Haramlek has a casino on the ground floor and a museum containing the royal relics on the upper floors. A walk around this area is indeed very relaxing and that will be possible only if you stay for a couple of days in Alexandria. Close by, you have the Helnan Palestine Hotel which provides a good view of the Mediterranean Sea. We took a high speed boat ride for 30 minutes and we got a good view of the Hotel . The kids had a great time in the high speed boat. Another important landmark of Alexandria is the Rosetta Stone. For thousands of years, the Egyptian civilization used the language of hieroglyphics and later this language was abandoned in favour of Greek and Latin. As the Romans took over Egypt they couldn’t understand hieroglyphics and this was a huge obstacle for anyone wanting to understand Egyptian history and culture. After more than a thousand years, when French soldiers were fighting in Egypt, a French soldier found a flat block of black basalt at a place called Rosetta, very close to Alexandria. This stone had three sections of writing – one in hieroglyphics, the other in a language reffered to as Demotic and one in Greek. This stone is known as Rosetta Stone and the inscriptions on this stone helped scholars to understand hieroglyphics. You can find the original stone today at the British Museum. Later in the day, we halted at Pompei’s Pillar. 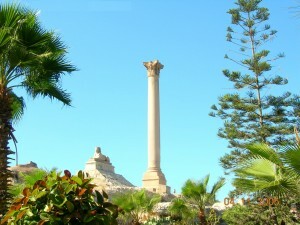 This Pillar, which dominates the area dates back to the 3rd Century. Pompei was Greek and once upon a time there used to be a Greek temple here. Today, only the pillar made of red granite remains. 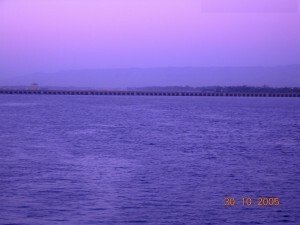 The pillar is 25 metres in height. This place was completely destroyed in the 5th century by the Christians who wanted to get rid of Paganism in Egypt. The great pillar however survived along with a few sphinxes. Close to the Pompei’s pillar there is the Roman Bath where once, Cleopatra used to bathe. Our guide Randa told us about Cleopatra VII who ascended the Egyptian throne when she was merely 17 years of age. She was the last pharaoh who ruled Egypt from 51 to 30 BC. The interesting part of the story was the birth of Julius Caesar and Cleopatra’s son and how the word Caesarean came into existence. As Cleopatra had a small stomach they had to cut open her stomach during delivery. This type of childbirth is called ‘Caesarean’ these days. After Pompei’s pillar, we passed by the Roman amphitheatre before halting for a seafood lunch. Later in the day, we stopped by to see Fort Qaitbey which is located at the spot of the legendary lighthouse and is best seen from a distance. It is said that some of the stones of the fort are from the lighthouse – especially those constituting the huge red-granite pillars. Thereafter, we visited the Catacombs which date back to the 1st and 2nd centuries. These catacomb were found by accident. This is one of the two catacomb sites in the world where Greeks and Romans were buried – the other one can be found in Italy. Known as the Kom-El-Shoqafa Catacombs, this sit e is the largest roman cemetery in the world – consisting of 3 levels cut in the rock. The whole structure is 100 feet deep. It is a combination of Roman and Pharonic art. The first chamber is called the Triclinium and was left unfinished. There are still bodies underneath the chambers and there was an attempt to excavate the place, however as there was a risk of the whole set of catacombs caving in, the excavation wasn’t carried out. There are lots of other places one can explore in and around Alexandria too – including the Graeco-Roman museum and a few lovely beaches along the north coast. Alexandria is also a good place to shop, especially for leather but we were short on time as we had to head back to Cairo. 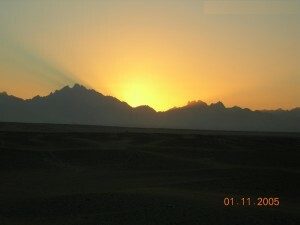 We finally left the place at 4.00 pm after a very interesting day in one of the most beautiful cities of Egypt. As our flight was almost after midnight and we had a few hours at our disposal, we went for a dinner on Aquarius – a floating restaurant! Here, we experienced some Egyptian cuisine and we were also entertained with some fine Nubian and belly dancing. We were lucky to be part of the celebration of an Egyptian wedding on board the Aquarius. Though we were extremely exhausted after one of our longest days in Egypt, we thoroughly enjoyed it too. There wasn’t a single day which was not filled with interesting experiences. Our only regret was not spending a few more days to explore much more of this wonderful country. 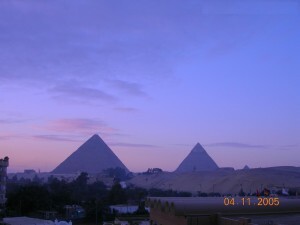 Whenever we make another trip to Egypt, I will love to share my experiences with you! 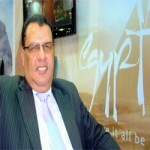 I recall that when we started COMPACT TRAVELS (The parent brand of Namaste Egypt), the first destination that we took to promoting was Egypt and I strongly recommend that you include Egypt in your list of destinations to visit in the immediate future. 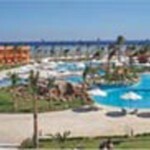 Because Egypt is a destination which has the only surviving wonder of the ancient world, one of the most beautiful cities in Alexandria, a beach holiday experience in Hurghada or even Sharm-el-Sheikh, a great cruise experience on the Nile cruise – you couldn’t ask for anything better when planning a holiday!